Levi Leipheimer (Astana) successfully defended last year’s Tour of California victory, winning the event overall on Sunday after a solid stage-winning performance in Friday’s decisive time trial. Britain’s David Millar (Slipstream) came in second place, showing that he’s nicely in shape for the forthcoming Paris-Nice stage race, starting on Sunday March 9. You can watch a highlights video of every stage of the Tour of California right here on www.cyclingweekly.com. The on-going and very tedious battle between cycle sport’s governing body, the Union Cycliste Internationale (UCI), and the organiser of the Tour de France, Paris-Nice and other events, Amaury Sport Organisation (ASO), got even more complicated this week. ASO has already removed its events from the UCI’s top-level ProTour race series, but now the argument is over whether ASO is sticking by UCI race rules. UCI president Pat McQuaid has now warned any team taking part in the forthcoming Paris-Nice that they are risking putting themselves outside the protection of the UCI, and at the mercy of ASO. Most race fans just want to watch the sport they love with the riders they love, and can’t be doing with any of this political willy waving. Come on ASO and UCI, let’s all have a group hug (but without the willies please). The Hog Hill cycle circuit is very nearly open for business, with the first 800 metres of track now rideable. Hog Hill was (eventually) selected as an alternative venue for the old Eastway circuit, which has been demolished to make way for the 2012 Olympic village. The Lee Valley Youth Cycle Club had the honour of being the first to try out the track and shot a video of the loop, which they posted on the internet for all to enjoy. With a swish club house next to the track, the circuit looks like it’s going to be cracking. We’ll be covering tomorrow’s (Saturday) Het Volk in full here on www.cyclingweekly.com. You can read our preview of the event in the news section. 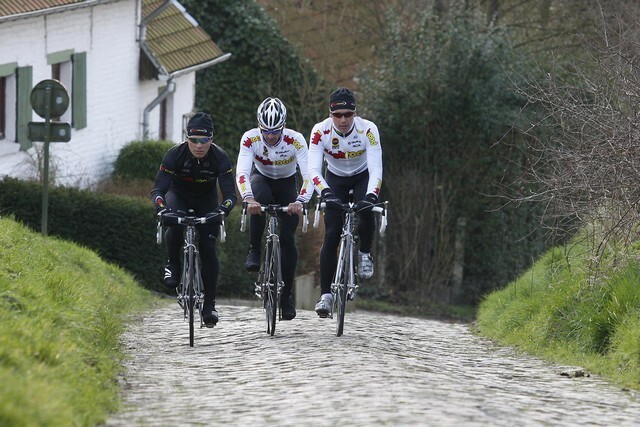 You can also see more photos of the stars taking part in the traditional mid-week recce of the route. Team Swift Racing launched this week at the NEC in Birmingham. The all-women squad, which includes British cyclo-cross stars Helen Wyman and Gabby Day, then wasted no time in getting down to business at a pre-season training camp in France. Our man Adam Tranter has been following the squad in his blog. Over-sized former England rugby star Martin Johnson joined Geoff Thomas at the final Revolution track event of the 2007/08 season on Saturday night. Johnson swapped gum shield for chamois to take part in the Geoff Thomas Challenge event for charity. Amazingly, he completed a circuit of the track without his bike breaking. In an unprecedented show of dominance, the Rapha-Condor-Recycling squad tok the first six places at the weekend Clayton Velo Spring Classic road race. Chris Newton took the honours, but the peloton was dominated by a sea of black RCR kit – a sign of things to come for the 2008 Premier Calendar series no doubt. Matt Green took his first win in France last Sunday, winning La Chapelle des Fourgeretz, near Rennes in Brittany. Green is supported by the John Ibbotson fund for the 2008 season and has been placed by the fund with VC Rennes. The win signaled a great start for Green who is one of the first riders to be backed. The fund was set up in 2005 in memory of former pro John Ibbotson, who died suddenly at the age of 27 of an undiagnosed heart disorder. Further details will appear in next week’s Cycling Weekly. 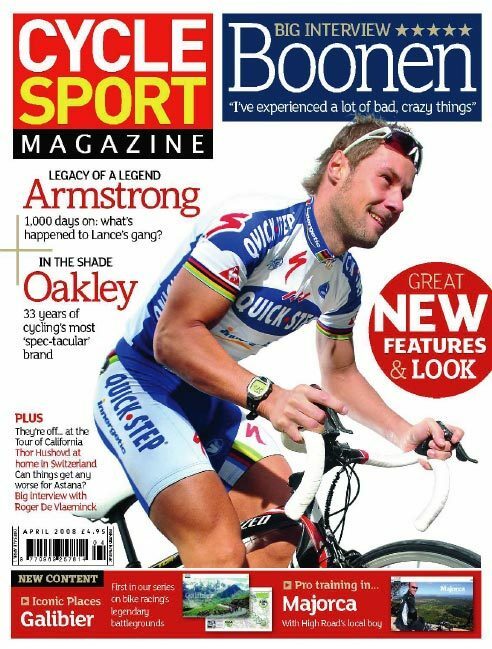 Already the world’s best magazine for fans of professional cycling, Cycle Sport gets a complete design overhaul next week with the April 2008 issue on sale from Thursday. You can expect the same great editorial, with some brand new, exciting sections thrown into the mix and a fresh new design.